Examples of how the liquid ink strokes work. The download is in a zip format suitable to install with StudioChris Brush Manager. The category is compatible with Painter IX, X, and 11. With Painter 12.1 we can load a library with brushes included or a category into the library of our choice. Thanks Skip, I can’t wait to see what I can do with these brushes. I love those brushes and plan to get back to liquid ink one of these days. It is a lot of fun, especially with the wet look of the brushes. Would you please re-post Skip’s Liquid Ink? it can’t be downloaded anymore. It is reposted. Thanks for letting me know the link had expired. Your help to everyone in their growth with digital art is more than spectacular. Wow. Also, I tried to download the Liquid Ink and the Thick Paint brushes but I receive a message saying that a download limit has been reached. I have a top of the line Mac (just a year old) and I have restarted it to see if that would help, but nothing changes the response. I have successfully obtained, for example, the Eastern water brushes. So I don’t know if the problem is at my end or at the other end. The problem is on my end. I now have a different subscription that allows unlimited access, but when the Liquid ink and Thick Paint was loaded, I didn’t. I thought the upgrade would grandfather in everyone, but it doesn’t. Anyway…both are uploaded and available for download. Thanks for dropping by and letting me know the problem. I really appreciate it. Thank you very much. Works fine now. The brushes are exciting and inspiring. No thank you for your willingness to share on what I considered the best blog on the Internet for Painter. Thank you again and again! That is the nicest thing anyone has said. I appreciate your comment so much. I have been remiss posting of late, but I almost have the Painter 12.1 Brush Management Primer ready to post. Maybe tomorrow, I hope, but surely by Tuesday. 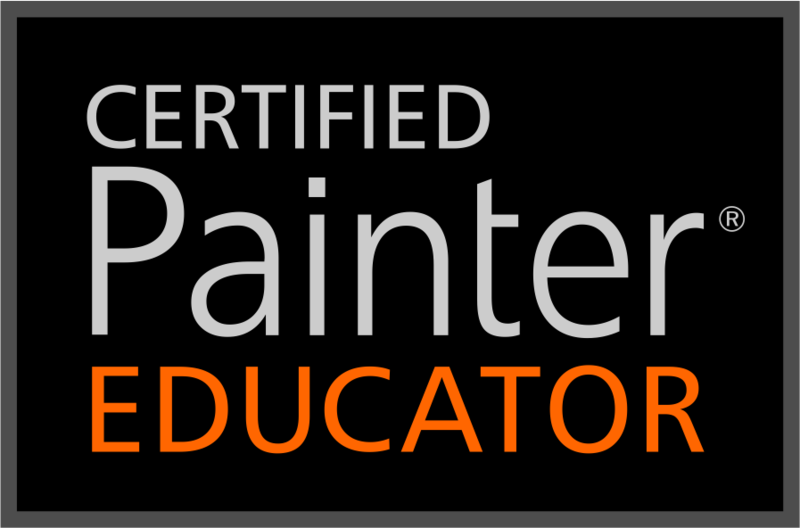 I just upgraded to Painter 12 after finishing all your Painter 11 courses. I have been successful in downloading all of your brushes to 12 except for one problem. When I used your Liquid Ink Library Link, it downloaded fine, but all the brushes in the library are “Splashing Water” Brushes, not the liquid ink brushes. Any chance you can correct this or tell me how I can move the brushes over from 11, if that is do-able? Sorry I didn’t see this before now. Saints preserve us!!! I have no idea how that happened. I will fix it and thank you very much for letting me know what happened. It will be later tonight. I am intrigued to figure this one out. The category file is correct…the problem exist only with the library. Right now am enjoying your new vidoes on your Oasis Brushes and following olong with painting the Iris. Thanks so much for sharing all these wonderful things. The download is working perfect now. Hi Skip, thank you so very much for making your dynamic and inspired brushes available to others. I enjoy using the drips and runs very much! I downloaded the liquid ink brushes and a few of the ones I was most excited about don’t seem to function properly for me. I took a screenshot but I can’t post it here. Basically, five of them (H2o ink, h20ink smooth, wet frayed, wet sketch and wet black) don’t paint in the color I am using, they all make marks in a navy ish blue. I have painter 12 and an imac. Any thoughts? THANK YOU. 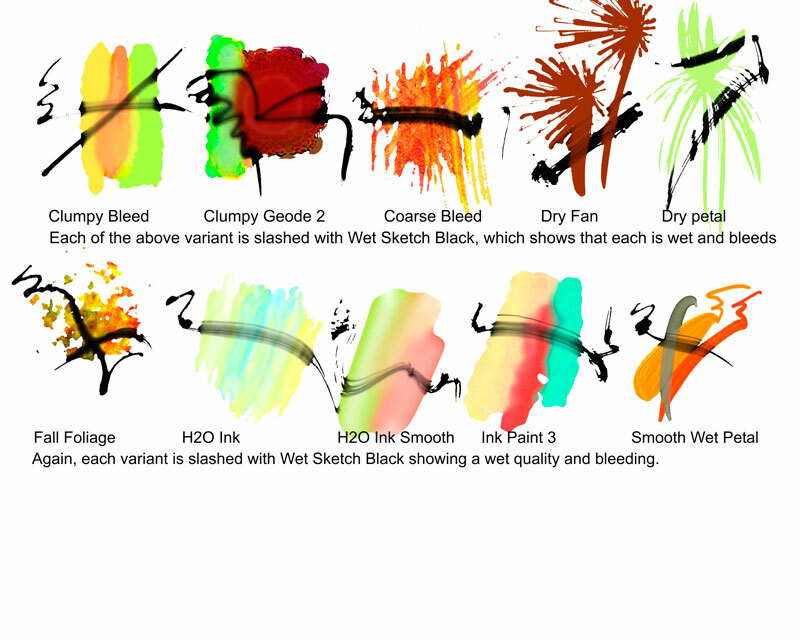 I’m not sure about wet sketch and wet black…I couldn’t figure out which brushes those were. The first three that you mentioned have their Color Variability set to Gradient, so the brushes paint the colors that are in the currently selected gradient. To change, go to Window > Brush Control Panels > Color Variability. It should say gradient in the drop down list. Change it to HSV and make sure the sliders are all the way to the left. That will allow you to select the color for painting. Hope this helps. Thanks for visiting and posting. I’m taking your brushmaking class and came to download the ink brushes. I’ve also downloaded some of your other brushes. No problem Kerry. Don’t forget to give me the extra information I need to answer your question in class. Thanks for visiting and making a comment. It means a lot to me. Ok, a little Greek and French in me but new to this downloading stuff. I have dowloaded both the Library and Catagory but I have no idea as to how to install this in Painter 12.1. I enjoy the liquid ink and this compliments many of my paintings. And I do hope to using yours and get a taste of new custom brushes. Appreciate your help. First let me suggest updating to Painter 12.2 and then 12.2 SP1. That way you will have the latest and greatest version. The decision of which file to use is yours. Painter can create multiple libraries, so if you use library download you get a new library with Skip’s liquid ink included. Or, if you download the category, you will install it into an existing library…the current active library. I do have a video in my post Brush Management for Painter 12.1 A Primer. Please watch the video and if you have any problems give me a shout. I’ll try to be quicker with my answer. 12.2.0.703 Is what I have on my MAC for Painter 12.While watching your video I went to work following your suggestions. I initially lost all of my other categories when I imported Skips Liquid Ink but wiggled around enough and somehow found my way back to my Portrait and Collage workspace and all brushes appeared in the correct categories including Skips Liquid Ink. Phew ! Looks like I will be visiting you site from time to time. Thanks for telling me your build number of 12.2.0.703. That is not the latest update. The latest update will give you a build number of 12.2.1.1212. You can find the Mac update to Corel Painter 12.2 SP1 at http://www.corel.com/corel/pages/index.jsp?pgid=800161&ppid=2900002 Install this update for the latest version. I’m glad everything worked out OK. Hope it continues. I hope you will drop by from time to time. Thank you for leaving a comment and the link to your site. I saw the beautiful painting that you did using Fall Foliage. I’m thrilled to see your work and to read your blog. Merci de laisser un commentaire et le lien vers votre site. J’ai vu la belle peinture que vous avez en utilisant le feuillage d’automne. Je suis ravi de voir votre travail et à lire votre blog. Thanks for the youtube vids Skip. Long time Painter 8 & 10 user & am coming out of a 5 yr. break where I did no graphic work. Now at P12 & Wacom 5 & you’re instructions have greatly sped up my reintroduction to using the program. Just downloaded your brushes which I heard about from the vids & will start reading blog. Appreciate the time & effort you have put in. I hope you enjoy Painter again. Be sure that your version of Painter 12 is 12.2. It was updated many times and the latest version was 12.2. Skip is this compatible with Painter 2015 ? 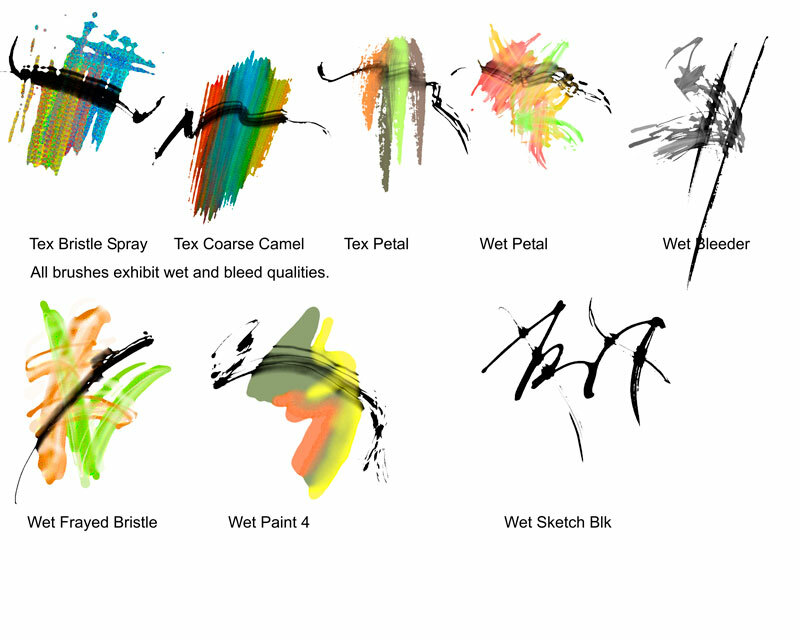 Yes the liquid ink brushes are compatible with Painter 2015. Brushes are forward compatible, but not backward. In other words, brushes made in earlier versions will work in later versions but the reverse is not true. Painter X brushes will work in Painter 2015, but Painter 2015 brushes will not work in Painter X. Hope this helps. Enjoy those liquid ink brushes. Thanks for your tremendous inspiration and generosity in making all your wonderful brushes available. I am having trouble downloading the liquid inks, though. I can see the page with the download button but upon clicking it I get the error “couldn’t connect to server.” Does the download work for you, Skip? I apologize for the inconvenience. The brushes are on HighTail for download. There is something wrong on their end. They are supposedly working on the problem, but it has been several weeks. I do have another system in place and will move all my data to the new system and drop Hightail, but I just don’t have time to do it right now. But, I will try to get to it soon. I have used hightail…as You Send it for many years. I am so disappointed in them these days, I have no choice except to leave them.